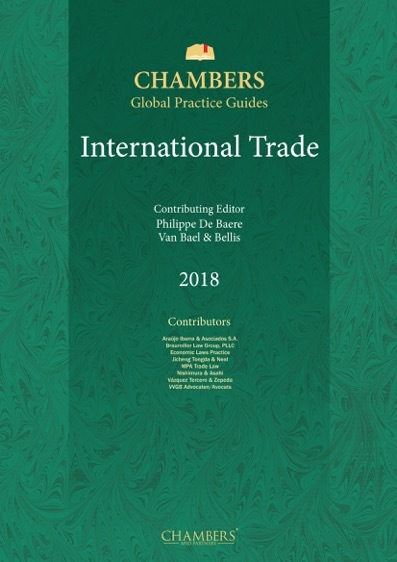 The International Trade guide provides expert legal commentary on key issues for businesses. The guide covers the important developments in the most significant jurisdictions. Van Bael & Bellis has the largest team of specialised trade lawyers in Brussels handling EU and WTO trade law. The firm has handled more than 400 EU anti-dumping cases and is the author of the leading treatise on EU trade law – ‘EU Anti-Dumping and other Trade Defence Instruments’. The firm also has a robust practice assisting both EU and non-EU exporters involved in trade remedy cases initiated by non-EU countries. With regard to customs law, the firm has developed a highly specialised practice in representing major multinationals in customs cases taken before the European Courts, the Commission and the WCO, as well as appearances in various national courts. With regard to WTO law, its strong global WTO practice includes representing governments in WTO dispute settlement proceedings and advising them on their accession negotiations and the harmonisation of national trade legislation. Until recently, the benefits of international trade were rarely questioned: free trade was universally believed to optimise the allocation of resources and to increase national wealth. The rise of populist movements in important trading nations such as the UK and the US, as well as in certain EU Member States such as Poland and Hungary, has shattered this consensus. Formerly obscure politicians have successfully ridden a wave of exclusionary nationalism, whereby xenophobia and economic protectionism have been coated in terms of regaining sovereignty or national greatness. Faced with the World Trade Organization’s inability to deliver a new round of trade liberalisation, WTO members have increasingly turned to regional or bilateral trade agreements. The Trans Pacific Partnership (“TPP”), the Transatlantic Trade and Investment Partnership (“TTIP”) and the EU-Canada Comprehensive Economic and Trade Agreement (“CETA”) are just a few examples of ambitious trade liberalisation agreements that go far beyond the traditional WTO disciplines in both depth and scope. Such agreements are no longer limited to the removal of barriers to trade in goods and services: they now encompass diverse areas such as investment protection, intellectual property rights, regulatory convergence, and common environmental and labour standards. Populist politicians and anti-globalist movements have presented these new agreements as a threat both to national sovereignty and to existing levels of social and environmental protection. Neither of these groups has shown excessive concern for factual evidence to underpin their allegations, but have somehow succeeded in capitalising on the widespread feeling of discontent among voters. The results have been dramatic. The TPP and TTIP have been shelved. CETA was concluded, but ratification in its current version appears unlikely. Existing agreements such as the North American Free Trade Agreement may need to be renegotiated in order to protect domestic producers from imports and avoid the delocalisation of factories. Supranational organisations such as the European Union have not been immune to the impact of populist calls for a restoration of national sovereignty and former greatness. The UK has chosen to invoke Article 50 of the Treaty on European Union, thereby initiating the procedure to leave the Union. Uncertainty reigns regarding the status of the UK in a post-Brexit world. It is highly unlikely that a comprehensive agreement governing the post-Brexit relationship between the UK and the EU27 can be negotiated and ratified before 2025. Any such agreement – whether it is a customs union, a Norway- or Swiss-type arrangement or a CETA-style comprehensive free trade agreement – will require conclusion and ratification by all Member States, according to the rules provided in each Member State’s constitution. The CETA saga has shown that this means that marginal regions such as Wallonia may end up blocking agreements that have the overwhelming support of other Member States. An agreement with the UK is therefore unlikely to be approved without there first being protracted negotiations with each individual Member State. In the absence of new regional and bilateral free-trade agreements, international trade will continue to be governed by WTO rules. The same applies to trade between the UK and the rest of the world. Indeed, once the UK leaves the EU it will no longer be a party to the free-trade agreements concluded by the EU with third countries. This return to prominence of the WTO comes, however, at a difficult moment. The global economic crisis coupled with significant over-capacities in many Chinese industries has resulted in the EU and US running large trade deficits with China, but blocking imports from China by imposing trade defence measures has become more problematic. First, the expiry of certain provisions in China’s Accession Protocol to the WTO means that importing countries are no longer automatically entitled to reject Chinese domestic prices and costs when determining normal value. Second, China has shown that it has the knowledge and determination to defend its WTO rights by an effective use of the WTO dispute settlement mechanism. This conflict between the call for increased protection from imports on one hand, and the disciplines on trade defence actions contained in the WTO Agreements on the other, made enforceable through the dispute settlement mechanism, could potentially break the system. Unable to impose WTO-consistent protectionist measures, large WTO members could simply decide to ignore WTO rulings, triggering a chain of retaliatory measures by other WTO members. Investigating authorities and trade practitioners will therefore need to be both creative and prudent: creative so as to use the existing instruments in a way that they continue to provide effective protection against unfair imports, and prudent enough to avoid measures that are easily overturned as being WTO-inconsistent. The present book is an attempt to take stock of the tools that are available in each jurisdiction by means of a questionnaire. The purpose of the questions was not to obtain an overview of the trade defence instruments available in each jurisdiction; after all, each jurisdiction is bound by the very detailed disciplines contained in the relevant WTO Agreements governing anti-dumping, anti-subsidy and safeguards investigations, so the various systems are characterised by a large degree of uniformity. The intention, rather, was to gain an insight into the way the investigating authorities deal with issues that are not harmonised, or where uncertainty remains regarding the correct interpretation of the relevant WTO provisions. Of particular relevance, clearly, were questions regarding the way investigating authorities will determine normal value in investigations against China now that the special normal value provisions contained in its Protocol of Accession have expired. Examples of the latter include the possibility of making cost adjustments in case of distortions and the use of out-of-country benchmarks. The national implementation of certain other WTO rules also remains unclear. Examples include the retrospective imposition of anti-dumping duties to imports that took place prior to the imposition of provisional duties, the treatment of certain adjustments to export price and normal value or, in the case of anti-subsidy investigations, the inclusion of subsidy schemes not expressly included in the notice of initiation or the precise content of the circumstances that would justify the imposition of safeguard measures. Information is also provided on the existence of so-called WTO-plus provisions in national trade defence legislation, such as a lesser duty rule or a public interest test. It is expected that such provisions will increasingly come under attack by the domestic industry, and may well simply be abolished in the future. A last group of questions addresses the rights of defence of interested parties and, in particular, the rights to obtain access to information and disclosure. In conclusion, investigating authorities will need to use the existing provisions and ambiguities in the WTO agreements to the fullest if they want to satisfy their protectionist constituencies. In certain jurisdictions, this may additionally require the abolition of so-called WTO-plus provisions. At the same time, the authorities will need to ensure that their investigations respect due process rights, and that any measures adopted have a realistic chance of surviving WTO dispute settlement proceedings. As a final remark, attention should be drawn to the special position of a post-Brexit UK. Existing EU trade defence measures will no longer apply to the UK once it leaves the EU. This means that, for a considerable period after Brexit, the UK industry will have no protection against unfair imports; only after the UK’s newly created investigating authority has concluded its own investigations will it again be possible to impose protective measures.